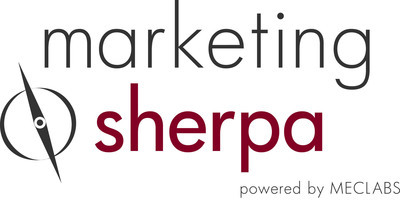 JACKSONVILLE, Fla., Dec. 12, 2016 /PRNewswire/ -- Companies practicing true "customer-first marketing" have a lot to gain based on the results of a new online survey conducted by MarketingSherpa (www.marketingsherpa.com). The findings indicate that nearly 60 percent of highly satisfied customers believe that the marketing of a company they were satisfied with "often or always" puts their needs ahead of its own business goals compared to 16.1 percent of highly unsatisfied customers — a relative difference of 269 percent. Similarly, for companies perceived as prioritizing customer needs against their own business goals, the satisfaction relative difference jumps to 488 percent. The MarketingSherpa Customer Satisfaction Research study of 2,400 consumers, sampled to reflect a close match to the U.S. population's demographics, was conducted in September and October 2016. The MarketingSherpa Customer Satisfaction Research study of 2,400 consumers, sampled to reflect a close match to the U.S. population's demographics, was conducted in September and October 2016. Half of the respondents (1,200) were asked to reflect on their experiences with a brand with which they are highly satisfied, and the other half (1,200) were questioned about a brand with which they are not satisfied. The responses of these two groups were then compared and contrasted against each other. The respondents from each age group, the Silent Generation (71-93); Baby Boomers (52-70); Generation Xers (34-51); and Millennials (18-35); were nearly evenly split between the paired surveys. The satisfaction chasm, not surprisingly, seems to translate into sales. Nearly 92 percent of satisfied consumers indicate they are likely or very likely to continue to purchase from brands they like versus 29.4 percent who are unsatisfied with a brand. "In this era of data-driven marketing and intense customer targeting, the survey results clearly indicate that brands should think beyond just aiming at their customer, and instead use that data to elevate the customer. We call this customer-first marketing," said Daniel Burstein, senior director of Editorial Content, MarketingSherpa. "If the customer is the king or queen, shouldn't they come first?" "By using marketing to serve customers and prioritizing customer needs before short-term business and marketing objectives, companies will gain a long-term competitive advantage and sustainable business success as indicated by the increases in purchase intent and loyalty we measured in the study." More than half of all respondents (56 percent) indicated that customer-first marketing was either important or very important to them. Only 8 percent of highly unsatisfied customers were very likely to continue purchasing — a 713 percent relative difference. These same satisfied customers are more likely to recommend a company to others (61 percent very likely and 30 percent likely). "Having worked in this industry for many years, I know most marketers want to practice customer-first marketing when they wake up in the morning and look in the mirror," said Burstein. "So we wanted to provide the data and insights to inspire these marketers." "Because, in the real world, this practice is exceedingly difficult. It requires marketers to view decisions though a holistic, long-term lens while immediate, short-term challenges are screaming for their attention every day. However, according to their customers, it is not impossible. 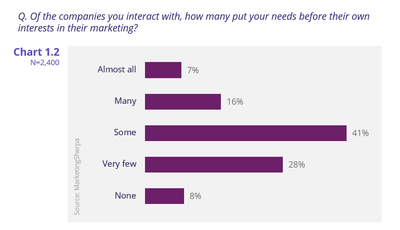 Only 8 percent of Americans have never experienced customer-first marketing. And there is still a large opportunity; just 23 percent of respondents said the marketing of many or almost all companies is customer-first." In addition to questions about customers' overall views of a brand's business and marketing practices, MarketingSherpa also wanted to discover customers' channel preferences and how their satisfaction impacted these preferences. When asked about engaging with each of the brand's marketing channels, 52 percent of satisfied customers often or always engaged with TV ads, followed closely by emails at 50 percent. Print ads by mail (direct mail), from the store (in-store circulars) and in magazines were consumed by 50 percent, 48 percent and 45 percent, respectively. While unsatisfied customers ranked channels in a similar order, they were much less likely to want to engage with the brands they were unsatisfied with. Only 29 percent often or always watched TV ads; just 28 percent read print ads from mail (direct mail); only 27 percent read print ads in a newspaper, magazine, or from a store (in-store circulars); and just 23 percent wanted to subscribe to email. "The satisfied customers produced by customer-first marketing and business practices are so vital to marketers because satisfied customers are more likely to engage and less likely to disengage across a range of channels," Burstein said. "Following best practices or investing in the right channels is not enough, if their companies don't practice customer-first marketing and business practices, marketers' channel investments will underperform. This justifies giving marketers a seat at the table of key business and marketing decisions to serve as an advocate for the audience." View the entire study at MarketingSherpa.com/ConsumerStudy. For questions regarding the survey or its methodology, please contact Erin Donker at erin.donker@meclabs.com. MarketingSherpa Summit 2017 is a showcase of inspirational stories of customer-first marketing. Building off Email Summit's heritage, the four-day 2017 Summit, taking place at the ARIA Resort in Las Vegas from April 10-13, 2017, will highlight some of the most successful digital marketing campaigns using email, data, mobile, social media and content, including award-winning case studies presented by brand-side marketers. There will be breakout sessions that offer interactive roundtables for marketing technology and messaging tips and advice from industry experts and brand-side marketers. Networking opportunities to exchange experiences will also be provided. Founded in 1997 and based in Jacksonville, Florida, MECLABS Institute is the world's largest research institute dedicated to discovering how people make choices. MECLABS has been involved in direct Research Partnerships with companies throughout Asia, Europe and the Americas since 2001. As an institute focused on offer-response optimization, particularly in the field of value exchange, the Institute is dedicated to taking an academic approach to improving the discipline of marketing by teaching its discoveries through workshops, online learning and a graduate certificate program developed in partnership with the University of Florida's College of Journalism and Communications. MECLABS' two publishing subsidiaries – MarketingExperiments and MarketingSherpa – publish experiments and provide insights to the marketing community.